Throughout the world, people are working hard to provide for themselves and their families, both now and for the future. Life is unpredictable for us all, but more so for those suffering from poverty and injustice in the developing world. We all want to make provisions for our loved ones, which is why it’s so important to have a valid Will. It’s also something that is best arranged prior to your retirement. Having a Will doesn’t have to be just about providing for your family. You can use your Will to help others, such as communities around the world in their own endeavours to lift themselves out of poverty. 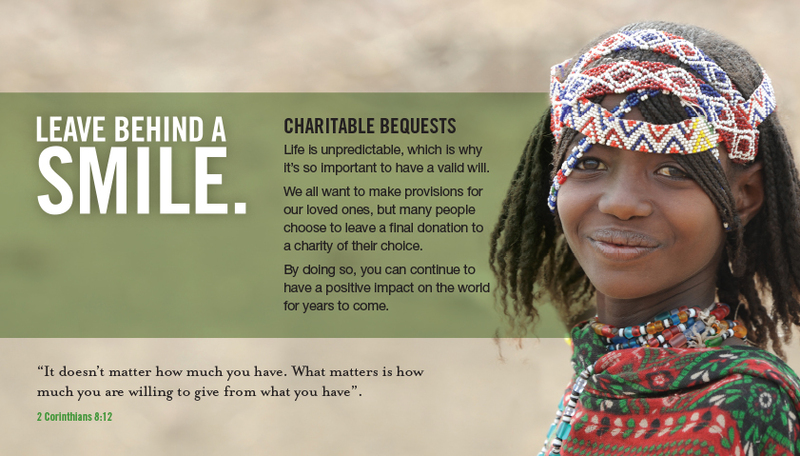 Please consider including Anglican Overseas Aid in your Will. You can leave your entire estate, a percentage amount or a specified amount to support our work. You can also choose to direct your bequest to specific activities, project or countries. Download our Bequest Pack to find out more and to see some suggested wording. For a confidential and no obligation discussion about planning your bequest giving, please contact our bequest specialist, Sue Riley, at Anglican Overseas Aid.